WED 11/11/09 – Iowa City, IA – The Picador, 33 E Washington, 21+, $6, 9PM – Tim Kaiser, Pelzwik, Talking Computron, Creme DeMentia, with guests. 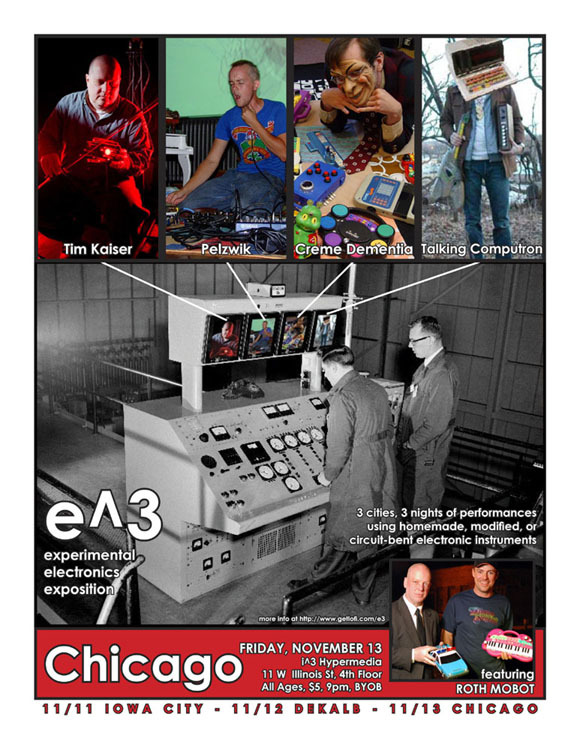 FRI 11/13/09 – Chicago, IL – i^3 Hypermedia, 11 W Illinois St, 4th floor, All Ages, $5, 9PM, BYOB, Tim Kaiser, Pelzwik, Talking Computron, Creme DeMentia, with special guests Roth Mobot. Tim Kaiser and his other-worldly instruments have been featured in Make Magazine on numerous occasions. Tim uses synthesizers and effects he has built himself to process and blend with the sounds from his electro-acoustic sculptures/instruments. Most of Tim’s instruments are painstakingly frankensteined together from existing instruments, circuits of existing and original designs, and vintage housings (not necessarily that you would know). NOT TO BE MISSED! Pelzwik, aka Nick Heimer, makes his own contact microphones in many different varieties. He employs these to route voice and acoustic instrument sounds into circuit-bent effects with bizarre results. Talking Computron is none other than Alex, webmaster of the popular circuit-bending blog http://www.getlofi.com. Listeners will embark on a smooth, minimal journey of sequenced circuit-bent synthesizers with additional layers of other electronic sounds. Austin Cliffe (Creme DeMentia) will hypnotize you with his found 35mm slide show while he slowly twiddles the knobs on a table full of circuit-bent toys blaring a wild, cartoonish wall of sounds. Patrick McCarthy and Tommy Stephenson form the duo Roth Mobot. They use sampling, an Amiga computer, and an array of circuit bent devices to immerse the audience in a layered, ever-evolving bath of electronic sounds.